Fifty-three flights from Heathrow airport had been canceled Friday in the continuing disruption caused by a crash landing at Europe's busiest airport. Investigators were analyzing why a British Airways Boeing 777 made a crunching touchdown short of the runway on Thursday, ripping off the plane's landing gear and severely damaging the two engines and wings. British Airways said it expected to operate all of its long-haul flights from Heathrow on Friday and 90 percent of short-haul operations. "The number of flight cancellations at Heathrow so far today is 53, mainly affecting short haul services," airport owner BAA PLC said in a statement released to the media at 0400 Eastern. "BAA is doing everything possible to minimize disruption to our passengers and additional staff are on hand at the terminals to assist passengers," the statement said. Nineteen injuries were reported among the 152 people aboard. The crumpled aircraft remained at the end of one of Heathrow's two runways Friday. CBS News correspondent Mark Phillips reports the landing is being called a minor miracle. There were no deaths and no serious injuries among the 152 people onboard. An airport worker says the plane's pilot told him he lost all power just a few hundred feet off the ground and just managed to glide the plane in, reports Phillips. Britain's Air Accidents Investigation Branch was leading the investigation of the incident. The U.S. National Transportation Safety Board also dispatched a team to assist in the investigation. David Gleave, chief safety investigator at Aviation Hazard Analysis, a private company, said a bird strike or fuel shortage would be among the possibilities investigators would consider. "I think at the moment we have such good systems on board the airplane for recording what's gone on, and the airplane is in a pretty good state to be able to retrieve these recorders fairly quickly, that they should have gotten the information out and be analyzing it during today," Gleave told the BBC. "So toward the end of today the investigators will start to have some idea of what went wrong," though further examination may be necessary, Gleave said. The editor of the Air Transport Intelligence news wire, Kieran Daly, told Britain's Sky News there was no "obvious explanation" for what happened. "The whole thing is pretty much a mystery. Any explanation is incredible... There are only a small number of potential reasons that could cause both engines to fail. You have to look at the weather, but it wasn't very spectacular," said Daly. "Then you think about birdstrike, but it is extremely rare that that happens even to one engine, never mind both. That leaves fuel starvation, running out of fuel, but that's incredible as well." CBS News correspondent Bob Orr reports there is considerable world-wide interest in the crash as it was the first significant incident involving the Boeing 777 - a plane that has been in service since 1994. Investigators will look at all onboard systems and pilot performance in an effort to make sure there is not some kind of systemic failure, Orr said, adding that factors to be thoroughly checked will include control systems, the jet's speed, approach path, and the pilots' decisions. The emergency landing delayed the take off of another BA flight from Heathrow Thursday, carrying Prime Minister Gordon Brown and a gaggle of British business leaders. 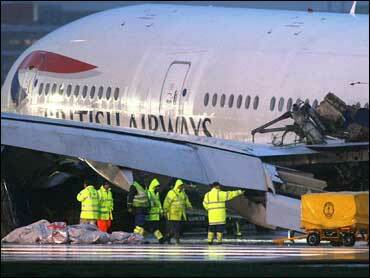 Upon his delayed arrival in Beijing, Brown praised the pilot of BA Flight 38, who managed to land his plane safely enough for 156 people to leave with only minor injuries. "I think it's right to pay tribute to the calmness and professionalism of the British Airways staff and the captain and what he achieved in landing the aircraft. "The speed of the evacuation we saw at first-hand, and the total professionalism and dedication of the staff. It's at times like these you remember you are in the hands of staff who do a remarkable job," said Brown. British Airways CEO Willie Walsh also praised his staff, calling them, "heroes", according to the BBC.